In yesterday’s post, I discussed our plans for St. Patrick’s Day, Happy St. Patrick’s Day! When we reached the seafood store, it was pouring rain. So much for the idea to grill something. We decided to buy a nice piece of tuna. A couple of years ago, we took a day-long seafood cooking class and seared tuna is the one method we learned well enough to keep doing. Salt and pepper all sides and edges. Using tongs, sear all sides and edges in olive oil over a very hot fire. Slice and serve over a salad. I’ve found that with the cooked fish, I prefer if some of the salad veggies are also cooked, so I roasted matchstick-cut carrots and some wedges of broccoli florets. For the greens, I used romaine and a red leaf lettuce. The dressing was the Ginger Lemon Salad Dressing that I posted in Weekend Cooking a couple of weeks ago, Two Ginger Salad Dressings. The dressing complimented both the tuna and the roasted carrots perfectly. Colcannon, made according to the Healthy Irishman’s recipe (POTATO WEEK–COLCANNON), proved to be a fairly easy dish but complicated by the fact that three different things have to be cooked and then combined. I was not at all confident that I could get them to come out at the same time, which would be necessary to get a hot dish. Especially with the timing of the tuna thrown in, too. So, I made the colcannon first and reheated it in the microwave. 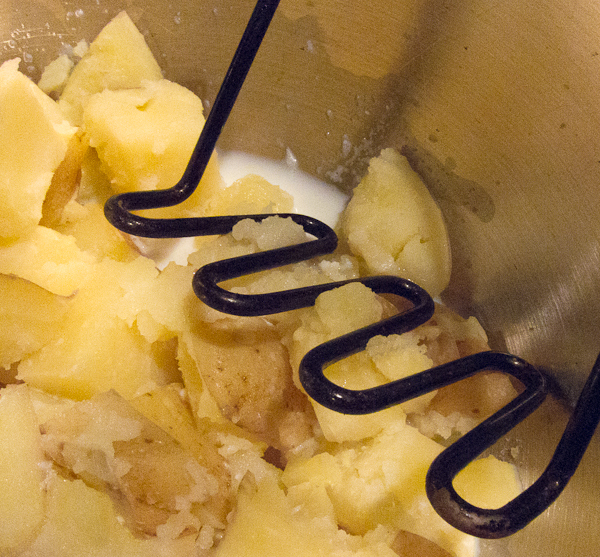 We hardly ever make mashed potatoes, but I do own a masher. Most of the time, it’s used for breaking up the chicken pieces when I make stock. As you can see, I refuse to peel potatoes even when they are to be mashed. Some of the best nutrients are in and near the skin and I like the contrast of skins with the mashed potatoes. 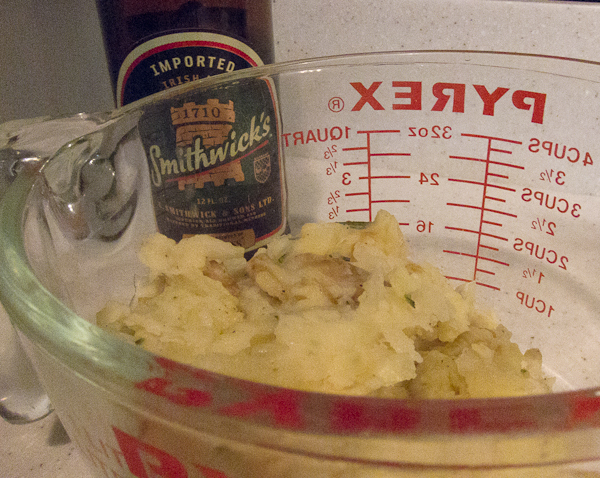 We only reheated for supper about a third of the colcannon that I made, but I’m sure the leftovers will be wonderful. The texture was not quite as nice as the colcannon we had in the Irish pub during our Kansas City trip–a recipe that almost surely included cream. But, the cabbage stood out more in our homemade version with a delightful and surprising touch of sweetness. Not a bad exchange since this version was also healthier. And the verdict was that this was a really great supper — Rick said so at least three times, including once this morning! We’ve had a good turnout for Weekend Cooking this week including several St. Patrick’s Day posts and at least two posts about quinoa. See the link list at Beth Fish Reads: Weekend Cooking: Shades of Hope by Tennie McCarty. I like the before-and-after posts! The tuna sounds GREAT! Sounds like a great dinner! I like the skins in my mashed potatoes, too!